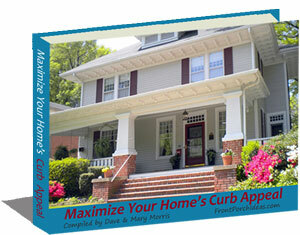 When you sign up for our newsletter, you get our free eBook titled "Maximize Your Home's Curb Appeal". Please sign up right here. You get our free eBook when you subscribe. 08-16-2018 - Front Porch Appeal Issue #94 - Is Summer Winding Down? 04-14-2016 - Front Porch Appeal Issue #76 - April Showers Bless Your Flowers! 03-10-2016 - Front Porch Appeal Issue #75 - Welcome to Spring! 03-22-2014 - Front Porch Appeal Issue #55- Yeah for Spring!! 09-24-2012 - Front Porch Appeal Issue #38 - Autumn Has Arrived! 06-21-2012 - Front Porch Appeal Issue #35 - Independence Day is coming! These newsletters have been archived, but please enjoy our more current newsletters. Thank you!